The latest leaked recording of Egypt’s generals conferring in Abdel Fattah al-Sisi’s office is the most damaging one yet. Earlier leaks were interesting, but not exactly shocking. The generals scrambled to legalize Mohamed Morsi’s detention after July 3 2013; dictated talking points to their media shills; and gave the Prosecutor-General instructions about high-profile cases. This surprised neither the coup’s friends nor foes, since everyone knows that the generals control every government official and micro-manage propaganda. The recent leaks, however, take things to a new level. The generals don’t just rubbish their Gulf backers; scorn Egyptians as a starving, miserable mass; and generally ooze contempt for anyone outside their ranks. The recordings reveal how, in private, Egypt’s peak military officers see themselves. In frank, relaxed banter, they discuss how to milk the Gulf monarchs for more billions; rue the Nasser military’s non-profiteering mindset; and generally come off as money-grubbing hirelings ready to deploy military force anywhere in exchange for cash. Thus in a five-minute conversation, the generals unmask their own elaborate self-mythologizing as nationalist, selfless public servants who have rescued Egypt and the region from an Islamist cabal. They reinforce critics’ longstanding claims that the Mubarakist Egyptian military defends not the national interest but its own sectional concerns. The main thrust of the military’s mythmaking is that it stands above the partisan fray, ably steering the sacred ship of state. Endlessly producing and reproducing this ideology is a matter of survival for Egypt’s profit-minded generals in times of revolutionary upheaval, when a restless public opinion shifted from welcoming them in the early days of 2011 to denouncing their violence and venality by mid-year. After the coup, Abdel Fattah al-Sisi and his SCAF fellows amped up their self-sanctification. Using the hapless Islamists as a foil, they cast the military as above politics and uniquely qualified to lead the nation. 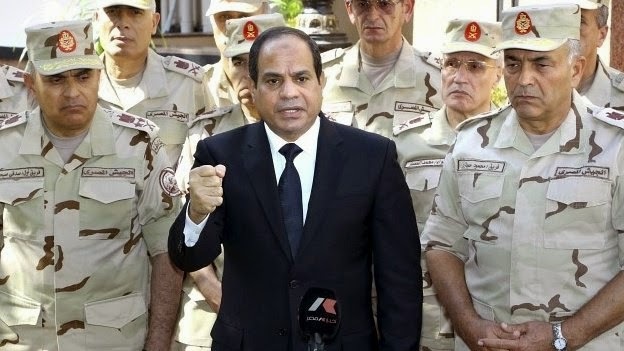 During his transition from general to president, Abdel Fattah al-Sisi lectured Ibrahim Eissa that all of Egypt should aspire to the military’s all-around perfection. No one expects the junta to say the same things in public and private. But when Abdel Fattah al-Sisi constantly hectors Egyptians about belt-tightening, hard work, and obeying the state while brainstorming with his generals about feathering SCAF’s nest with Gulf cash, something more significant than hypocrisy is at work. In their own words, the generals’ core myth of unassailability is exposed as the shoddy, pathetic construction that it is.